Karen Bates was the winner of the Swarovski Optik binocular competition held by World Land Trust (WLT) at the British Birdwatching Fair (Birdfair) 2015. She told us what the prize means to her. 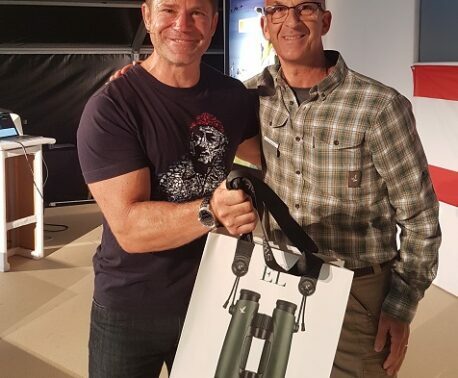 I was so excited to have won the binoculars as a result of entering World Land Trust’s competition at Birdfair 2015, they are a wonderful prize. I used to live in Leicestershire and went to the Birdfair 20 years ago with my husband and children – my eldest son, then six, won a wonderful pen and ink drawing of a pair of Barn Owls which adorns our wall to this day! 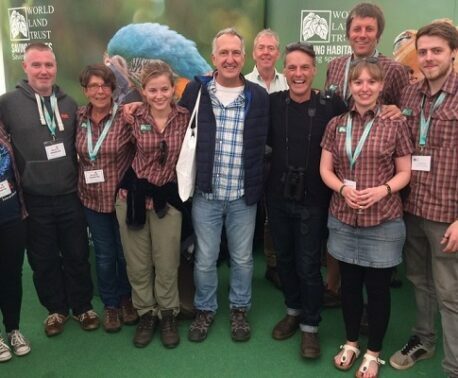 This was our first return trip to the Birdfair since then – what a massive difference. It has gone from a very small affair to a huge festival of birds and birding. This time there was only my husband and I and we stopped off for a few days on our way to Edinburgh from Devon, where we now live. While at the Birdfair we had a great time visiting all the stands and catching up with old friends and acquaintances from years ago, including Paul Stancliffe who now works for the British Trust for Ornithology. I remember Paul helping me recognise birdsong on a bird race about 30 years ago when my husband was in a ringing group at Attenborough Nature Reserve in Nottinghamshire. We also bumped into Julian Sykes, who we have met as a guide on many a bird holiday in Spain and further afield. 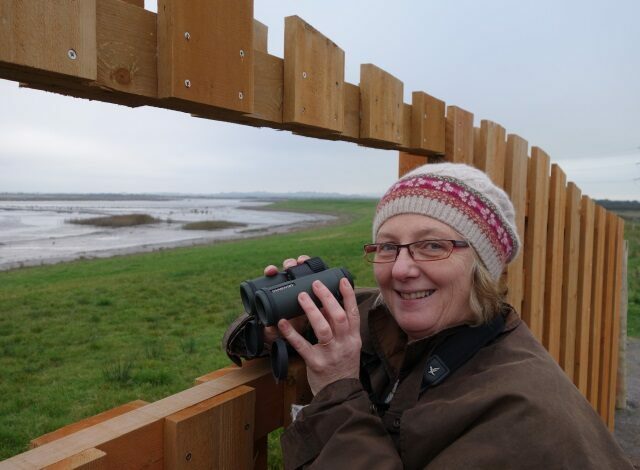 These days in Devon my birdwatching is usually done accompanying my husband at the Exe Estuary Bowling Green Marsh hide, where he volunteers for the RSPB. My new binoculars have already been in use both there and on a recent trip to Steart in Somerset, where we were treated to amazing views of Short-eared Owl. My birdwatching experience has been enhanced spectacularly by these fantastic Swarovski Optik binoculars, which are so light and easy to carry and yet give incredible clarity and light. For the future we have taken ideas and information from many of the stands at the Birdfair and have booked our next birdwatching holiday to Sri Lanka in spring. The binoculars will no doubt be in constant use looking at the diverse wildlife and birdlife that this great destination promises. Finally, I just wanted to say how impressed I was to learn all about the work of World Land Trust. Your stand at the Birdfair was full of information and I have been receiving your informative newsletter which demonstrates the great work that you continue to do in the world. Thank you once again for this amazing prize which will be well used and appreciated for years to come. WLT welcomes guest blogs and feedback from supporters. If you have been to WLT events or visited WLT project areas, please let us know! Write to us at WLT, Blyth House, Bridge Street, Halesworth, Suffolk IP19 8AB or email info@worldlandtrust.org.